“You can’t do that!” tile job. Posted By: admin Tag: Etcetera... | Comments Off on “You can’t do that!” tile job. John and Alison Brophy’s tiled driveway. While living in the Canary Islands several years ago, John and Alison Brophy, owners of Flicks Bar, wanted their driveway tiled to match their backyard. 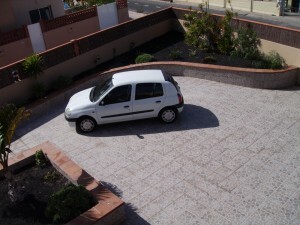 While tile is a very commonly used material indoors and outdoors in the Canaries, we’d never seen it on a driveway. “You can’t do that!” I was told time and time again. People were certain the tiles would break when a car rolled into the driveway and parked. You can tile any surface so long as you employ the proper technique and consider the environment. So we proceeded with the job. Even the construction workers across the street looked-on in disbelief as I tiled the entire driveway. Many years later John and Ali are still great friends and their tiled driveway hasn’t cracked. Having now been a renovation contractor in Ottawa for several years, I don’t recommend it here when you consider our winters are a tad worse than in the Canaries.